Some things are just naturally beautiful. The lilting arc of flower petals floating downwards in the breeze. The life cycle of bamboo as it grows from small, soft shoot to a towering forest. But the most beautiful? A car, daintily sliding sideways, from its wheels emanating the most graceful melody as the driver rounds a corner without touching the barrier walls a single time. Or at least, that’s the reality that Funselektor Labs wants you to experience in its precision racing game Absolute Drift, and with the Zen Edition hitting the PSN store there’s never been a better time to take the dive. Absolute Drift is a free-roaming top down racing game with a loose steering system that’s perfectly designed for maximum drifting. 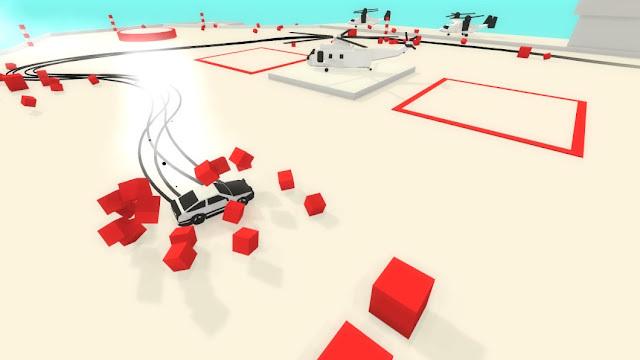 The controls are fine tweaked to make this game stand out compared to any other top down racer you’ve played – steering into a turn will make your car slide, steer further and risk your car spinning out, steer counter to the drift and you might regulate your momentum long enough to stabilise your car. It takes some getting used to, but with these controls every single corner is a calculated risk and learning to pull them off effectively is exhilarating fun. The overworld itself is divided into sections, each with its own courses, challenges and collectibles to find. 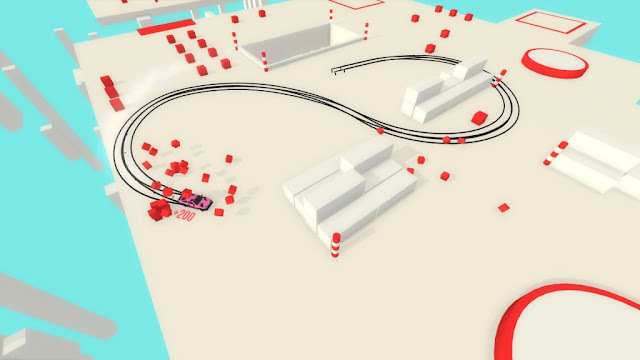 Advancing to the next course requires you to find and complete a variety of small drift related challenges on the overworld, such as doing donuts around certain landmarks or making jumps between some perilous gaps. These little challenges aren’t too difficult, but finding them and completing them is pretty fun in itself. I only wish that they weren’t so clearly telegraphed, and it were more possible to pull off some improvised stunts a la Tony Hawk Pro Skater, except with a car. 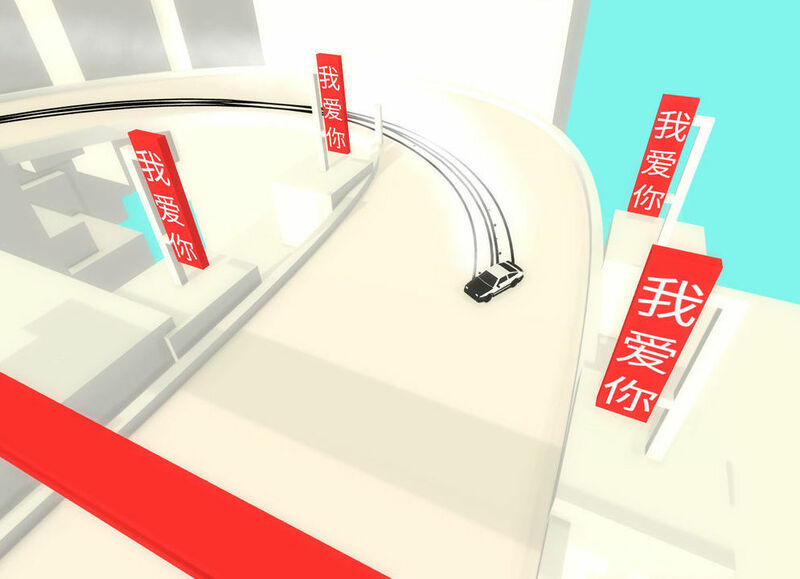 Instead, nearly every cool drift, jump and run you can think of is marked already by the game as a task which must be completed before you’re allowed to advance to the next part of the game. It’s still a lot of fun; it just lacks the sense of freeform creativity that I enjoy in stunt games. The game isn’t terribly long either and you can unlock everything pretty quickly, but getting 100 per cent completion will take a little more time and a lot more skill. The bulk of the game however is going to be spent in the standalone courses which can be accessed through little buildings scattered over the game world. These courses range from Point A to Point B time trial races, circuits where you’re challenged to rack up points or free roam zones where you can chain tricks together for a high score. Each course has five achievements to complete, and each of them are decently varied that it will have its own feel and strategy to it. My favourite were the time trial races as these tended to have the craziest hairpin turns which feel great to hurtle past. The free roam zones inspired by Gymkhana were hit or miss, depending on level design, and the circuits were well meaning but felt the least differentiated compared to the other mission styles. Completing lots of achievements also opens up the Midnight Drift levels, which is a point A to point B time trial in complete darkness, with only your car’s headlights to light the way. I found the midnight levels to be among the most frustrating in the game, especially the ones with achievements for not hitting a single wall: not easy when you can’t properly see the walls. Absolute Drift’s strength though is that its calm aesthetic, soothing music and focus on small, achievable challenges means the game never ends up feeling frustrating. It’s not a pixel perfect precision game which takes glee in watching you fail; instead it’s a fluid mastery game which requires practice to properly develop expertise. The game’s developers know this perfectly, opting to keep the tutorials sparse and giving the players lots of room to experiment until they figure out the mechanics for themselves. This is a game that’s perfect both for short sessions and for long afternoons, and with the variety in challenges it’s hard to get bored too quickly. 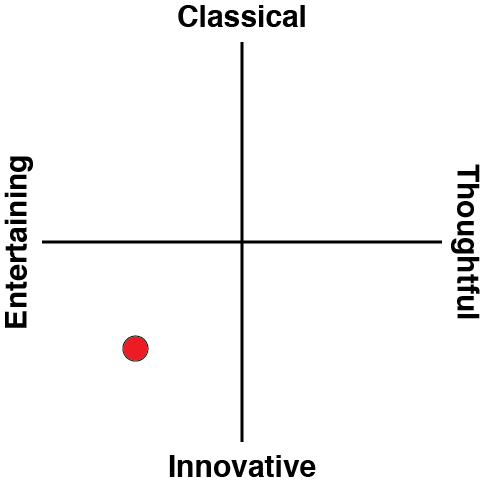 The game exhibits a minimalist Japanese aesthetic which I expect will be met with mixed reception. Overall, the look is sleek and economical, but once a lot of time has been sunk into the game it begins to feel rather plain. The levels do exhibit visual features reminiscent of Japanese architecture such as bridges, archways and construction sites, but many of them are expressed with grey block abstractions that aren’t visually interesting. I admit that additional visual flair might serve as a distraction from the gameplay elements, but eventually the off-white hues become tiresome for the eyes. I do quite like the consistent black skid marks left behind by your car, even when the car is airborne. It’s a distinct visual signifier of your motion patterns and almost makes the player feel like they’re painting across the landscape with every turn of the steering wheel as a stroke of the brush. The music is worth a positive mention too, featuring hours worth of electronic and ambient tracks which go along with the game’s aesthetic nicely. A few of them are memorable and catchy, and while the peaceful vibes might seem like a mismatch at first, they calm you down if you’ve ever spent way too much time trying to perfect a single corner. Unrelentingly simple and yet uncontrollably addictive, Absolute Drift is a comfort game in every sense of the term. As soon as you become accustomed to the loose controls, it’s easy to lose yourself in the fantasy of driving down a path, gently spinning the steering wheel and feeling weightless from inertia as your car floats sideways. 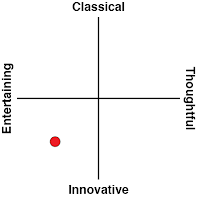 This is a game meant to be played slowly yet deliberately, achieving a state of heightened concentration that might well be called Zen. Bet you never thought you’d feel this peaceful on a racetrack, huh?